When Intel initially released its Airmont platforms, Braswell for mini-PCs and Cherry Trail for tablets, it was unclear whether or not we would see custom desktop build equivalents, rather than just pre-built units. All the SoCs in the Braswell range were officially labelled as mobile parts, falling under the Celeron codename, for this reason. Intel has also recently released Xeon D, tackling the SFF space for enterprise use, but in the back of our minds we were always expecting an upgrade to the low-end Bay Trail motherboards with soldered down processors. Having already heard some news on the grapevine, ASUS is first to publicly display their motherboards online (well, one at first), albeit with no link through the main site and as a result this link was passed on to us by SH SOTN. 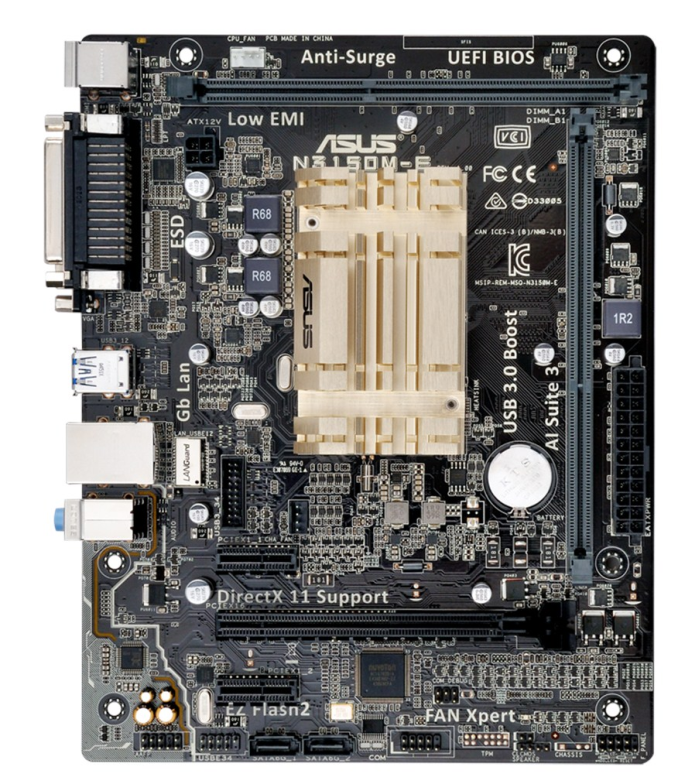 The N3150M-E is a micro-ATX motherboard with the Celeron N3150 processor built-in, and due to the 6W TDP being low enough, we also get a built in fanless heatsink. Braswell supports two DDR3L-1600 memory channels, and perhaps somewhat oddly we have them both here at right angles to each other. Online Intel lists the maximum memory compatibility for the CPU as 8GB, although the Beebox we reported on earlier is rated for 16GB so I would assume that the motherboard side of the equation should be able to do this too. There is a full PCIe 2.0 x16 slot with x8 electrical (but might not offer more than x4 due to SoC limitations, and according to the spec sheet is only x1), allowing for those esoteric arrangements of Atom plus discrete graphics or just for an additional PCIe card, such as a RAID card for a storage platform. By default the N3150M-E gives two SATA 6 Gbps ports, a COM header, a USB 2.0 header and a USB 3.0 header. There are also two USB 3.0 ports on the rear, along with a Realtek network port and Realtek ALC887 audio. The audio solution is an upgraded one, with at least PCB separation between the audio channels and a couple of filter caps. Onboard video outputs are via a VGA and a HDMI connector, and we also get an LPT port for good measure. The Celeron N3150 is a 14nm Airmont based quad core solution, featuring a 1.6 GHz base clock and a 2.08 GHz turbo. Onboard graphics are via Intel’s Gen8, with 12 EUs having a boost frequency of 600 MHz. Technically Brett has already had a quick review of Airmont cores in the Surface 3's Cherry Trail SoC, though it would be interesting to get a desktop variant in to see how the performance compares to previous desktop Atom units. 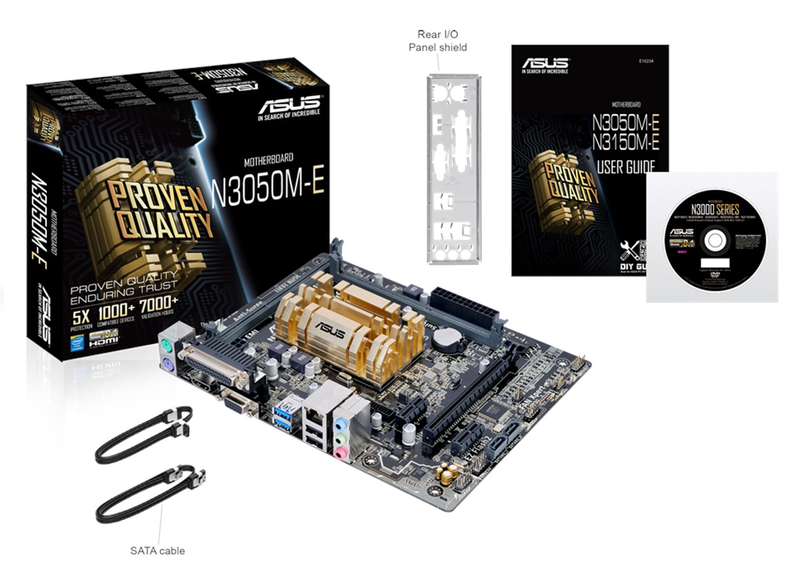 Update: It seems within a minute or two, ASUS has also posted the N3050M-E variant online as well. This uses the Celeron N3050, a dual core version with a 1.6 GHz base frequency but a turbo of 2.16 GHz. It's for a fw/gw/router/proxy/vpn/etc build, most likely using pfsense. yes - the cores are around Core2Duo and you have 8 of them, @ 20W, makes sense. I meant will the board in this article totally smash the one I linked. I think you meant the other way round? Totally different markets; all they have in common is approximate TDPs. 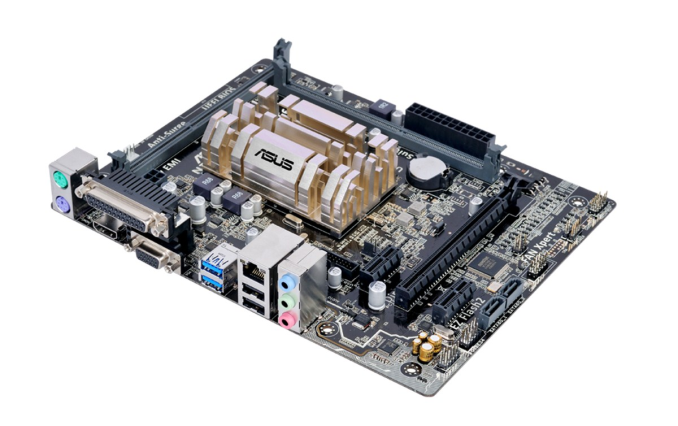 The Asus is a basic low power board suitable for a low end desktop or potentially controlling some sort of industrial hardware via the legacy IO ports. Although that market probably would want a longer warrantied lifespan. I was joking, of course, but just after I wrote that it struck me that the truth could be something even more pathetic: This could actually be for companies like Home Depot, so they can get their POS terminals off of insecure Windows XP and stop letting our credit card information be stolen.